WBO middleweight champion Peter Quillin (29-0, 21 KO’s) sees himself winning on Saturday night in his title defense against Gabriel Rosado (21-6, 13 KO’s) at the Boardwalk Hall, in Atlantic City, New Jersey, USA. Quillin, 30, sees himself getting a stoppage in over #9 WBO Rosado, and it’s difficult to disagree with that belief because this fight on paper looks to be about as competitive as Quillin’s first title defense against Fernando Guerrero. That fight was a mismatch the moment it was signed and Quillin took a lot of heat from boxing fans for not taking on a more dangerous opponent. Now we’re getting a repeat of that with Quillin taking on another less than dangerous foe in Rosado, and naturally Quillin realizes that he’s likely to win easily. Rosado was blown out by WBA middleweight champion Gennady Golovkin earlier this year by a 7th round TKO loss. It was a disappointing performance from Rosado because he really didn’t make much of a fight of it other than putting forth a little effort in the 5th round. Most of the fight Rosado was circling and just trying not to get hit. It was not what you’d like to see from a challenger, because he appeared to be afraid of mixing it up with Golovkin. He probably would have been stopped sooner had he chose to mix it up, but it was still a poor plan by Rosado because he was easily controlled by Golovkin in the rounds where he ran around the ring. In Rosado’s last fight against J’Leon Love it was ruled a no contest due to Love testing positive for a banned substance. Rosado fought really well in that fight and showed off his excellent power. 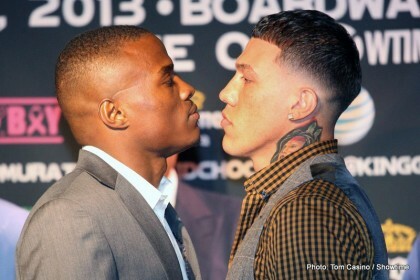 That’s the way that Rosado needs to fight if he’s to have any chance of beating Quillin on Saturday. Circling the ring endlessly won’t help him beat Quillin; it’ll just lead to Rosado losing by a 12 round decision or him getting stopped in the later rounds. What Rosado needs to do is go after Quillin early and test his chin with the best shots he has because Quillin has been hurt before against Dionisio Miranda, and that was really the only puncher that he’s faced during his career. Quillin also didn’t look all that great in his fight against former WBO middleweight champion Hassan N’Dam N’Jikam last year in October. In between knocking N’Dam down six times, Quillin was hit a lot and he didn’t look so great in taking those shots. N’Dam was able to control some of the rounds when he wasn’t getting dropped. However, for Rosado to be able to win this fight he’s going to have to put Quillin under constant pressure and show a good chin in the process. Previous boxing news: Deontay Wilder: I’ll conquer the world, then take care of Tyson Fury!